Plate armor is one of the most recognized styles of armor, and is oftentimes seen as the quintessential armor of knights, although it was actually favored by many warriors. And with protection like this Gothic Suit of Armor, it is not hard to see why. This stunning suit of gothic plate armor is modeled after historic examples of traditional plate armor that echoed the gothic style that was popular all over Europe. 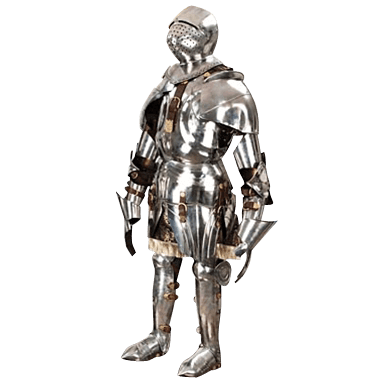 In fact, this armor is the Italian variant of classic German gothic armor, which makes it both distinctive and impressive, both in look and in function. Its popularity came from it being quite ornate in appearance, yet it still provided more than enough protection to keep a warrior perfectly safe from all but the strongest of attacks. The smooth edges and curves of this armor were as much for decoration as for defense, as they yielded no area to grip or hold to lance or sword, ensuring that blows slid easily off the steel before they could do any lasting damage. This suit of armor is fully articulated and hand forged by Windlass Steelcrafts from 18 gauge steel. It is wearable, and it also comes with a full skeletal body, which means that you can put it up on display when you are not busy wearing it out and about like real armor. Included with the skeletal body is a decorative skirt, to make the armor look more impressive, as well as a wooden pedestal, which elevates the armor to a height of 7 feet when it is displayed. The armor does come in pieces, so that it can be either worn or put on the stand. The armor includes all the leather straps necessary to wear it or suspend it properly on its skeletonized body. 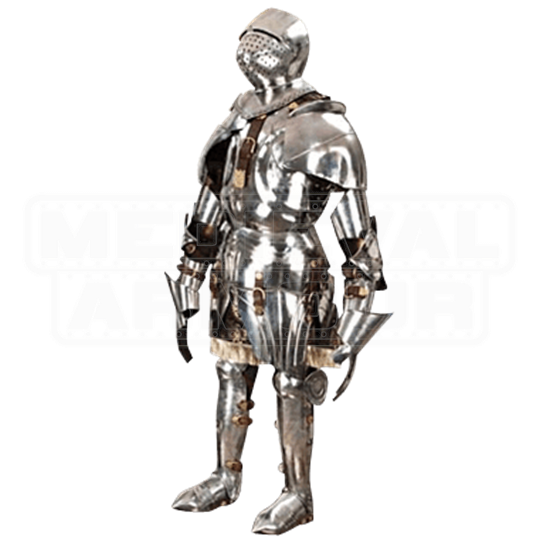 If you are looking for a full suit of armor to wear the next time you enter battle, then look no further, and if you want a great display piece, you are in luck, because this Gothic Suit of Armor fulfills both of those requirements quite nicely indeed. This armor is crafted by Windlass Steelcrafts.